In early October 1960 Allan Williams returned to Hamburg to oversee the prolongation of the original contract between the Beatles and Bruno Koschmider of the Kaiserkeller. He was also eager to see how his latest export to Hamburg, Rory Storm & the Hurricanes, were getting along and maybe also to see if he could find more jobs for some of the other acts in Liverpool. When Williams arrived in Hamburg, he was surprised to find that the Beatles had improved tremendously since he had last heard them. The long nights at the Indra Club and the Kaiserkeller, and the influence from the more experienced Londoners The Jets (which included Tony Sheridan) had turned them into, if not brilliant entertainers, to at least competent musicians. Rory Storm & the Hurricanes, who had replaced Derry & the Seniors at the Kaiserkeller earlier the same month, had also after a slow start begun to get the hang of things. They too, after a more luxurious time spending the entire summer at the Butlins Holiday Camp at Pwllheli in North Wales, seemed to have what it took to make it in the rough clubs of the St. Pauli district of Hamburg. The first mention of the Akustik Studio session was printed in Mersey Beat, Vol. 3, No. 63. According to the article Allan Williams heard Lu Walters singing with the Beatles in October 1960 in Hamburg during an informal session at the Indra club. The article continues: "At the recording session, Lu recorded 'Fever' (Davenport, Cooley) with John, Paul and George but he had the drummer from his own group, Ringo Starr, playing with them. The next title he recorded was 'Summertime' (Gershwin) and he was again backed by the Beatles, who also played on the third disc 'September Song' (Anderson, Weill)." Allan Williams: "Wally's (Lu Walters) favourite songs were 'Fever' and 'Summertime'...there were, if I remember rightly, four demo discs made by the Akustik engineers...I mislaid mine at a party, pissed again." (The Man Who Gave The Beatles Away, 1975). "...we went to this studio which was behind the station in Hamburg and they did 'Summertime', 'Fever' and 'September Song. '...Afterwards Allan said 'Who wants to buy the record? '...the sum total sold was six copies..." (The Beatles - From Cavern To Star Club, 1997). Ringo Starr: "I recorded with Rory over in Hamburg. Somewhere out there is an amazing acetate which I'd like a copy of. We did 'Fever' and another track.' (Anthology, 2000). George Harrison: "We also recorded with Lu Walters...He was a guy who thought he was a singer. He paid to have a record made of himself..." (Anthology, 2000). Paul McCartney: "We helped out on a recording of 'Fever', with Lu of Rory Storm & the Hurricanes. That was done in a little demo studio in Hamburg..." (Club Sandwich, No. 72, 1994). 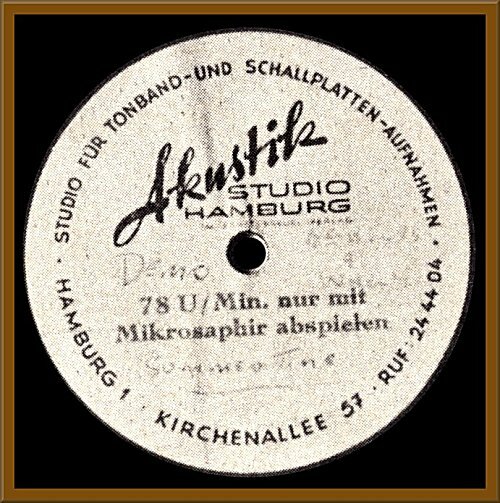 Neither the discs nor any original documents seem to have survived from the Akustik Studio session. This forces us to rely on the rather conflicting information given in hindsight by those present at the session, and the information to be found in the article published in Mersey Beat in late 1963. Mersey Beat claims that three acetates, carrying three different recordings were made. This information has never been verified elsewhere. Instead, all other sources state that originally there were only one, possibly two recordings cut onto disc. In principle, all sources accounted for agree that 'Fever' was cut at the session, but whether this recording finally made it on to disc is uncertain. The evidence that a version of 'Summertime' was waxed is much more substantial. The proof is a photo published exclusively in the US edition of the Williams/Marshall book 'The Man Who Gave The Beatles Away.' The photo shows a 78-rpm record with the words 'Beatles and Wally' 'Demo' and 'Summertime' written across the label. Lu Walters told Mersey Beat in 1963 that he recorded a version of 'September Song' at the Akustik Studio session. Johnny 'Guitar' Byrne also backed up this claim. These claims remain to be verified by an independent source. The same goes for a claim made by Mersey Beat that a disc of this recording should exist, or at least existed when the article was published in 1963. The 'B' side of the acetate contained no music. Instead it comprised commercials for goods sold by the Klockmann Company who had a leather bag store in the bottom floor of the building where the studio was located. As opposed to the recordings of the Quarry Men and Byrne in Percy Phillips' studio in Liverpool where the recordings were made directly to disc, the Akustik Studio recordings appear to have been taped first before acetates were cut. The information given by Byrne about multiple copies being made after recording would support this theory. If this were the case, it might also explain why different sources disagree on the number of songs recorded at the session. Although Walters and the Beatles originally may have cut three songs, it is possible that not all of them made it on to disc. Finally, there is in my opinion, no reason to doubt Byrne's claim that each of the participating musicians bought themselves copies of the disc/discs and that Allan Williams himself got one. This leaves us with six copies, of which not one seems to have survived. It has been said that the songs cut at the Akustik session should have been from the repertoire of Rory Storm & the Hurricanes rather than the Beatles. A preserved play list from the time published in the Anthology book proves that at least 'Summertime' was among the numbers the Beatles regularly used to do in Hamburg. It's also quite possible that 'Fever' at least occasionally was included in their repertoire although this still remains to be finally proven. A less obvious choice of song is 'September Song.' It is hard to think that this song was from either the Beatles or the Hurricanes regular repertoire. Maybe Allan Williams suggested they should do the song. It was after all he who was paying for the session. He also planned, when he had returned to England, to use the acetate/acetates to get a record contract and maybe he felt that 'September Song' was something that would catch the ears of the record executives. Both Rick Richards and Peter Wharton of the Jets has pointed out that Lu Walters from his choice of material seems to have been a pure ballad singer and that the songs cut at the session therefore very well might have been picked from the repertoire of jazz and soul artists and not by obscure rock examples of standards. If they are correct, it was the original Peggy Lee version from 1958 that was the model for Lu Walters performance of 'Fever' and not Elvis Presley's version from 1960. Peggy Lee's version was originally released in the UK on the single 'Fever'/'You Don't Know' (Capitol CL 14902) and the EP 'Fever' (Capitol EAR1 1052), while Elvis Presley's interpretation was included on the LP 'Elvis Is Back!' (RCA RD 2717/SF 5060). The black American soul singer little Willie John cut the original version of 'Fever' in March 1956, but it is not very likely that this is from where Walters had picked it up. Little Willie John's version of 'Fever' was released in the UK on the single 'Fever'/'Letter From My Darling' (Parlophone R 4209). Countless singers have done 'Summertime' over the years. The song comes from the musical 'Porgy And Bess' (1935) and among the artists who have recorded it is Sarah Vaughan whose 'Summertime'/'I Cried For You' (Philips PB 455) was released in 1955. Gene Vincent's rendition can be heard on the LP 'A Gene Vincent Record Date' (Capitol T1059) and the single 'Summertime'/'Frankie And Johnny' (Capitol CL 15035), both released in the UK in 1959. 'September Song' was originally written for the theatre play 'Knickerbockers Holiday' in 1938. The most likely source is a recording made by Johnnie Ray in 1959 and released in the UK on the album 'A Sinner Am I' (Philips BBL 7348). When cutting a version of 'September Song' in 1960, Lu Walters and the Beatles were ahead of their time. No rock artist had recorded the song before them, but others would do so later. Lou Reed recorded a version of the song in the mid-1970s and Ian McCulloch of Echo & the Bunnymen had a minor hit in the charts with the same song ten years later. This small area of Beatles history is covered in confusion, yet its importance can't be denied because it is the first time that John, Paul, George and Ringo ever recorded together. Over the years I have discussed the sessions with some of the people present and the stories do differ. In the 1970s I took Allan Williams along to the Keystone Press Agency with his photograph of the Beatles at Arnhem Cemetery, to ensure that he received royalties from any publication of the picture and also to see that it wasn't lost to posterity. I also asked Allan whether he had a disc from the Akustik session. He told me that he'd left it behind in a London pub. 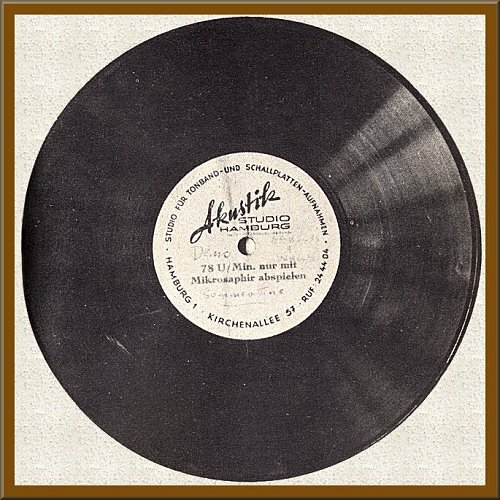 When Hans writes that a copy of this disc existed at the time of the Mersey Beat article, he is right - Allan certainly had it in his possession throughout the 1960s, although there were also other copies that existed at the time. For many years Virginia and I used to visit Johnny Byrne and his wife Margaret at their home in Crosby and conversations often drifted to memories of various events, including the Akustik sessions. As far as I could ascertain, Allan had been very impressed by Lu Walters' voice and wanted to make a record of him. Lu was the second lead vocalist with Rory Storm & the Hurricanes and did, indeed, sing mostly ballads. If you look at the Rory Storm & the Hurricanes history on this site you will see a sample of the numbers Lu actually sang on stage with the Hurricanes: 'Fever', 'Summertime', 'Let It Be Me', 'Beautiful Dreamer' and 'Mailman.' Cilla Black also sang 'Fever' with the Hurricanes. At the time when she asked me to become her manager, she said she wanted to be a jazz singer and asked if I could find a jazz trio to back her. She told me that her favourite singer was Peggy Lee. It's also logical that Allan would wish to record Lu rather than the Beatles because he considered the Hurricanes to be a top group at the time and rated them much higher than the Beatles. Obviously, with Lu as vocalist, this meant that Rory wouldn't be singing on the recordings. Pete Best also went into Hamburg city centre to buy drumsticks at the time and wasn't present. I believe it was felt that Hurricanes drummer Ringo Starr was more familiar with the numbers they were recording and would remain on drums. In fact, it seemed as if John, Paul and George (Stuart Sutcliffe was also absent from the sessions) were actually just providing vocal harmony as Lu played bass, Ringo drums and Ty Brien lead. I was also told that the discs cost three marks each, but only six of the acetates were bought. No one knows what happened to them. Rory Storm had one (perhaps he did attend the session, although he didn't sing, just as he attended the Wyvern auditions), Lu gave his copy to his ex-wife, Williams left his in a London pub and Ty Brien also bought one, but it couldn't be traced after his death. Johnny Guitar also recalled that John and Paul bought a copy each, but they have never mentioned doing so. Allan Williams actually paid for the recording session and it's interesting to note that after Lu had recorded his numbers, the Beatles asked Allan if they could record, but he refused to pay for them to do so. It seems that the memories of the Beatles themselves in the 'Anthology' is far from reliable. Hans is a noted Beatles historian and has researched this area of Beatles history in his acclaimed book 'The Beatles - From Cavern To Star Club', published by Premium Publishing in Stockholm, Sweden. He would also like to thank Rick Hardy (aka Rick Richards), former member of the Jets, for proof reading and sharing his knowledge and would also like to thank Peter Nash and Premium Publishing for their kind help.